Wall Street is in the midst of shedding some of its overbought conditions that have persisted in the prior two weeks. The major averages have been lower for the totality of the trading week leading up to Thursday. Small Cap stocks expressed the largest decline on Wednesday and post the release of the ADP private payroll data. The Russell 2000 Index fell 2% followed by the Nasdaq (NDX) that fell nearly 1% on the day. The Dow Jones Industrial Average (DJIA) and S&P 500 (SPX) fell a little more than .50% on the day. The selling pressure seems set to resume with equity futures lower ahead of the opening bell Thursday. The U.S. equity future weakness mirrors the weakness in European indices and comes ahead of the European Central Bank Meeting this morning. Additionally, headlines surrounding Eurozone economic growth for Q4 2018 are breaking. The Eurozone economy grew 0.2% in the final quarter of 2018. Year-over-year growth has fallen to 1.1%, the slowest pace in five years. 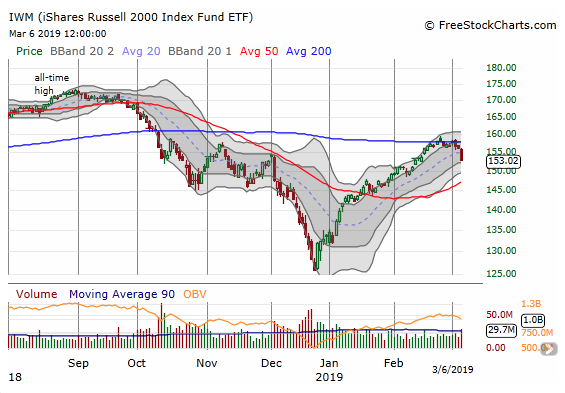 As we revert to the U.S. market conversation and the easing of overbought conditions, we can’t help but realize that Wednesday’s 2% dive in the Russell 2000 found the index breaking below its 200-DMA. Not a good sign! In addition to Russell’s weakness, the financials have come under pressure. While the financial sector has rallied significantly off its December 2018 lows, it never truly broke-out. 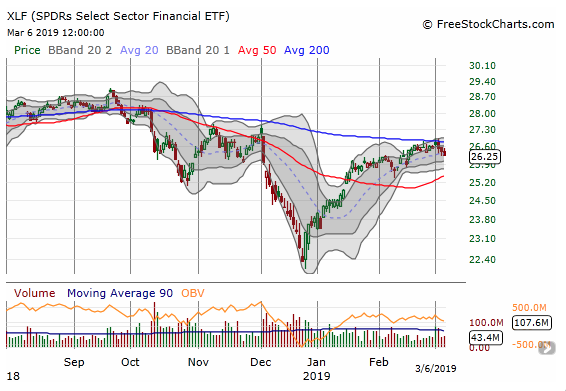 As one can see from the chart below, The Financial Select Sector SPDR ETF (XLF ) is now breaking its uptrend. The tech sector heavy Nasdaq has been holding up well and, as usual, has outperformed its peer indices during the 10-week rally. With Facebook (FB) shares also rallying hard of late (last 2-trading sessions), the social media stock still hasn’t proven enough to rally the tech sector as a whole. Tech stocks are holding up relative to the S&P 500 or even the Russell 2000, but the rising wedge that's been coiling up for a month now suggests it may not last, says Adam Mancini, a full-time trader closely followed on Twitter. 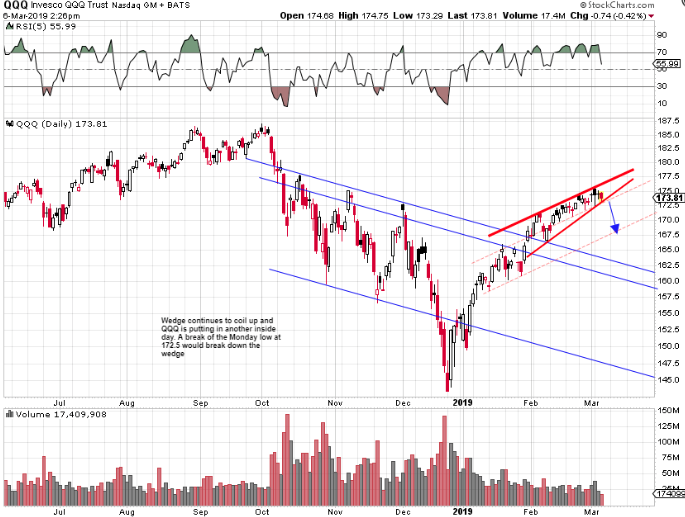 Mancini offers the following chart that indicates a possible decline is ahead for the tech sector ETF (QQQ). Alongside the markets working off some of their respective overbought conditions, volatility is making a comeback. While the VIX doesn’t lend itself to predictive or actionable technical analysis, it is somewhat useful as an indication of market hedging activity that can be applied for long portfolio managers. With that being said, with yesterday’s sharp rally, the VIX is back over the 20-Day SMA for first time since December 2018. Stay tuned for our latest State of the Markets (SOTM). Our subscribers will be able to review the video this evening and our visitors will be able to review it tomorrow morning. In addition to our weekly SOTM, please review our daily Technical Market Recap with Wayne Wilson.